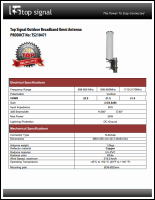 This product has been discontinued and replaced by the Top Signal 2X HiBoost 4K Smart Link TS542111. 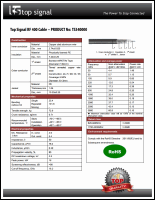 Upgraded commercial-grade 400 coax cable delivers double the square foot coverage of the regular Top Signal HiBoost 4K system. 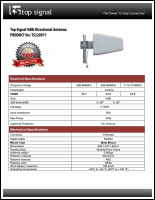 Provides improved signal for small to average-sized homes, small offices, condominiums, and apartments. 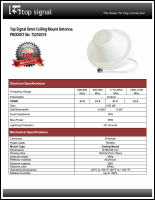 The Top Signal 2X HiBoost 4K is a single-antenna system designed for homes and small offices that need improved cell signal reception across multiple rooms. The 2X 4K improves both voice and data to reduce dropped calls and missed emails and texts, keeping your family members and friends connected with a stronger cell signal. 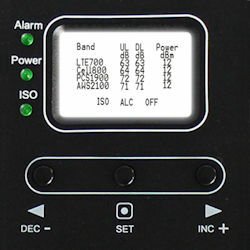 The Top Signal 2X HiBoost 4K features a backlit LCD display and controls for gain and power. The Top Signal 2X HiBoost 4K system uses the same booster as the standard kit, but includes ⅜‑inch 400 coax cable with half the signal loss of the standard 240 coax. 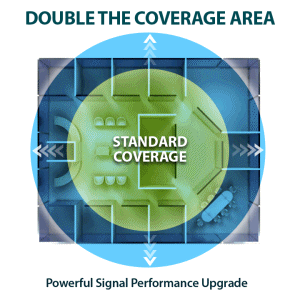 This 2X system will double the coverage area provided by your inside dome antenna. Who is the Top Signal 2X HiBoost 4K for? Small to average-sized homes with typical cellular user and data loads. 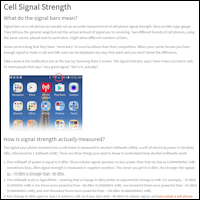 Small offices and home offices that need improved cell signal for a limited number of users. Apartments and condominiums in areas with poor cell service. 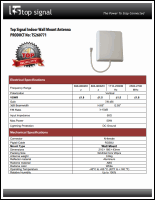 The Top Signal 2X HiBoost 4K receives the outside cell signal, amplifies it, and rebroadcasts it inside your home through a ceiling-mounted dome antenna or wall-mounted panel antenna. This allows you to stay connected in areas where cell service is poor or where your home’s construction materials interfere with signals from the local cell tower. How much area will the Top Signal 2X HiBoost 4K cover?